Istanbul is the most heavily populated city in Turkey and one of the largest cities in all of Europe; an estimated 12-19 million people call it home (just for reference that is 20 times the size of my hometown of Portland, Oregon). Turkey is split by the narrow strait called the Bosphorus with Europe on one side and Asia on the other. Not only is the city split geographically but culturally as well as it is a melting pot of many different cultures and religions. In the course of a day you’ll encounter scantily clad women in short skirts and half shirts alongside extremely conservative women in burkas and everything in-between. 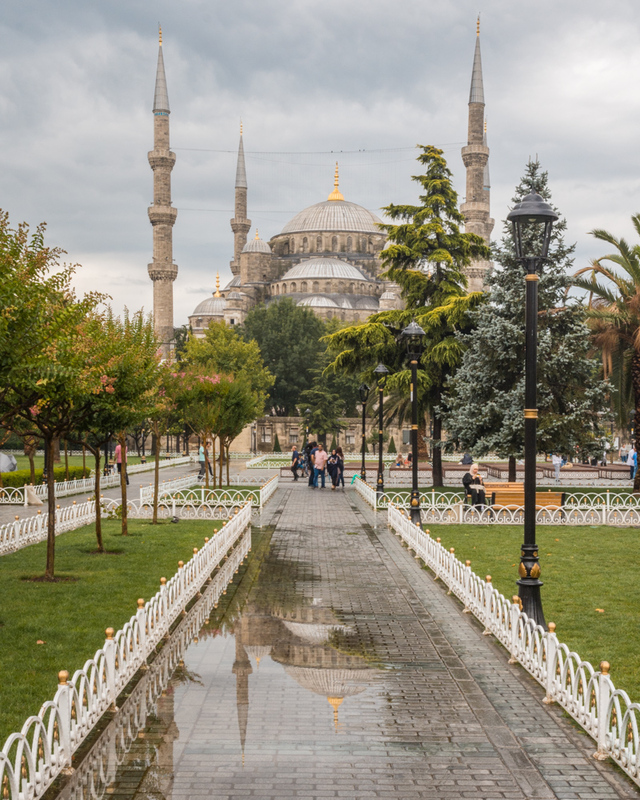 The city is gigantic and sprawling and if you only have a limited amount of time in Istanbul, deciding where to sleep, eat, and explore can be overwhelming. Follow our detailed 3-day itinerary to get the most out of your trip to this amazing city! Key phrases to help you get around; “mer-ha-ba” is “hello”, “tay-shay-koo-ay-dare-em” is “thank you very much”, “goo-lay-goo-lay” is “goodbye” if you are staying and they are leaving, while “hose-check-out” is “goodbye” if you are leaving and they are staying. A 5-10% tip at restaurants is acceptable and expected. Round your fare up for taxi drivers. Haggling over price is expected and encouraged at shops in all of Turkey. When they state a price, counter with a price that is roughly half of what they are asking. You should be able to meet somewhere in the middle. It’s super safe! I never felt uncomfortable or afraid even for a minute in Istanbul. The old city of Istanbul is centrally located and only a short walk to the Grand Bazaar, the Blue Mosque, and the sea. It is lined with shops, restaurants, and bars and is quite lively in the evenings with locals and tourists alike. Hotel Empress Zoe is a tranquil paradise in the center of the bustling old city. With gorgeous, peaceful gardens, plenty of comfortable seating areas tucked into quiet corners, and bubbling fountains – it is the perfect place to relax after a long day of city exploring. The building is old and traditional, with wisteria snaking up the sides and spilling onto the terraces; but has been beautifully remodeled inside and out. Gorgeous antique furniture, quilted drapes, and 4-poster beds fill the unique rooms that overlook the old city below. Stunning paintings, intricate brass lamps, and colorful tapestries add creative whimsy to every corner. Start each day with a plate (or two!) of their delectable breakfast spread; fresh fruit and veggies, yogurt, homemade granola, a variety of cheeses and jams, freshly baked rolls and muffins, and delicious egg dishes that vary daily. Take your time, sipping coffee in the shaded and peaceful garden with birds chirping overhead. And finish your evenings on the lovely rooftop terrace that is surrounded by views of mosques on one side and the sea on the other. Relax with a bottle of wine while watching the gorgeous sunset from the best seat on the block! If you’re anything like me, you’ve been looking forward to a day of shopping in the Grand Bazaar for weeks before you finally arrived in Istanbul. So waiting until day 2 or 3 just isn’t an option. Plus there are so many things to see and do in Istanbul! Start bright and early on day 1 with a delicious breakfast spread at Hotel Empress Zoe – you’ll need your energy today. Then walk the 3/4 of a mile to the bazaar. You’re going to go shopping twice today – once just to look, and then again to buy. So consider this first visit your “scouting trip”. Walk around, compare prices, take photos of your favorites, take business cards of the shops you like, but don’t buy anything… yet. You won’t be able to walk more than 10 feet without hearing “hello lady!” “where are you from?” “please, come look at my shop!” “just looking just looking” “can I have your money?”. It’s an incredibly overwhelming experience and you’ll be exhausted when you leave. When you first arrive you’ll be given a small pouch containing disposable undies and a scrubber. Once ushered to your gender-specific area, you’ll be directed to the changing room and offered a towel. Be sure to stick some coins in your pouch as a 10-20% tip split between your two attendants is expected (and they will make a bit of a show about saying goodbye when they are finished). From the dressing room you’ll be taken into the hamam where you will sit for 10-15 minutes on the hot marble rotunda to open up your pores before someone comes over to scrub you clean. After your rinse you’ll be directed to another room for your oil massage and then finally you’ll finish with a shower. You’ll leave feeling relaxed, invigorated, and ready to head back into the hectic bazaar to make your purchases! Once you’ve purchased your new Turkish treasures, head back to Empress Zoe to drop off your bags and then walk over to Meşale Cafe for appetizers, traditional Turkish music and dancing, and a flavored hookah. You’ll be endlessly entertained by the whirling Dervish and the passionate group of instrumentalists that accompany him. This place gets packed in the evenings so the people watching is just as entertaining as the performance! Again, breakfast at Hotel Empress Zoe is a must. Breakfast begins at 8am so get there early and head out for your day of Istanbul sightseeing right after to beat the crowds. You’re going to be surrounded by very conservative tourists today so ladies may want to consider covering their shoulders and knees and men should wear long pants. Start with the massive and impressive Sultanahmet Camii (nicknamed the Blue Mosque) which is a short 5-minute walk from the hotel. Marvel at the huge courtyard and take time to read the informational signs to learn a bit more about the traditions of the Muslim religion. Then get in line where you’ll be provided proper attire (no matter what you’re wearing, it probably won’t pass muster), and head inside (it’s donation only). Directly across the way from the Blue Mosque is a giant domed building that looks quite similar. That’s the Hagia Sophia and it’s where you’re headed next. It’s technically called a museum but unlike most museums there are no statues or paintings on display – you simply wander around the massive mosque and admire the architecture. 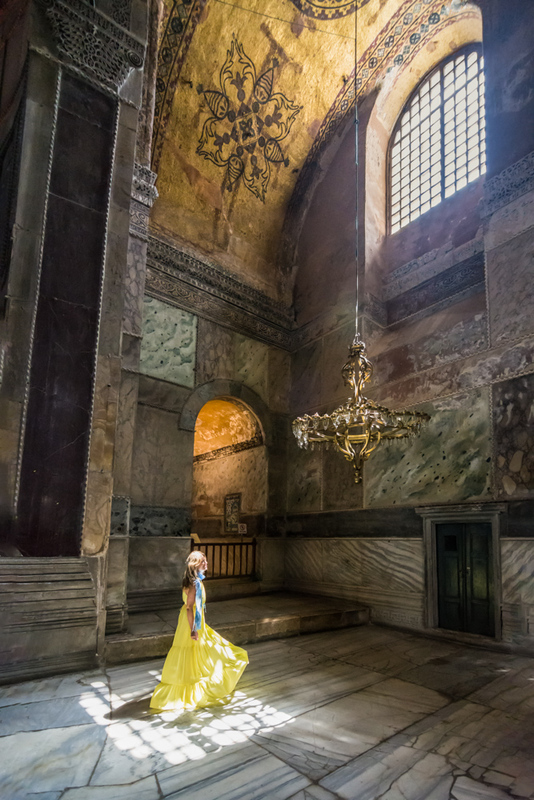 The Hagia Sophia has a complex history – it has been constructed 3 times, destroyed in riots, and has served both as a Greek Orthodox church and an imperial mosque. The original gorgeous gold mosaics depicting Jesus and the Virgin Mary were covered up when the church was converted to a mosque but there are areas on the second floor where parts of the plaster have been removed to reveal the remarkable designs underneath. Next, cross the street and head to the Basilica Cistern (also known as Yerebatan Sarnici) which is a massive underground water reservoir that has an estimated water storage capacity of 100,000 tons. It doesn’t take long to walk to the end of the cistern where the strange Medusa heads are on display but while you are exploring the area, consider the fact that the huge detailed marble columns were essentially created to support a giant tank that no one was really ever meant to see. On your way out stop at the super touristy but massively entertaining sultan photo stand and splurge on the 35 TL (~$10 USD) back-lit frame for your new prized photo souvenir. I promise, you won’t regret it. 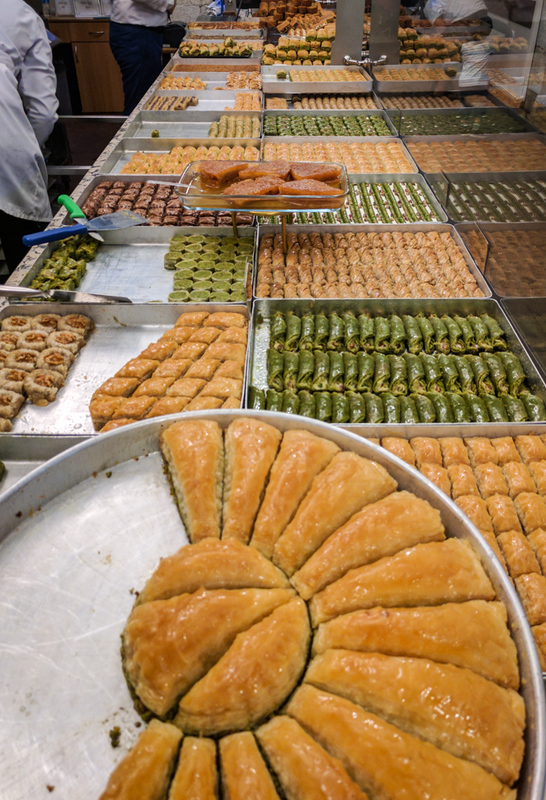 Take a break from sightseeing for a tasty afternoon treat at Hafiz Mustafa, arguably the best baklava spot in the city. Fill up a box with one of everything so you can snack on the delicious treats all day! After enjoying your sweet treats, head over to Topkapı Palace to check out the spectacular former residence of the sultans of Istanbul. 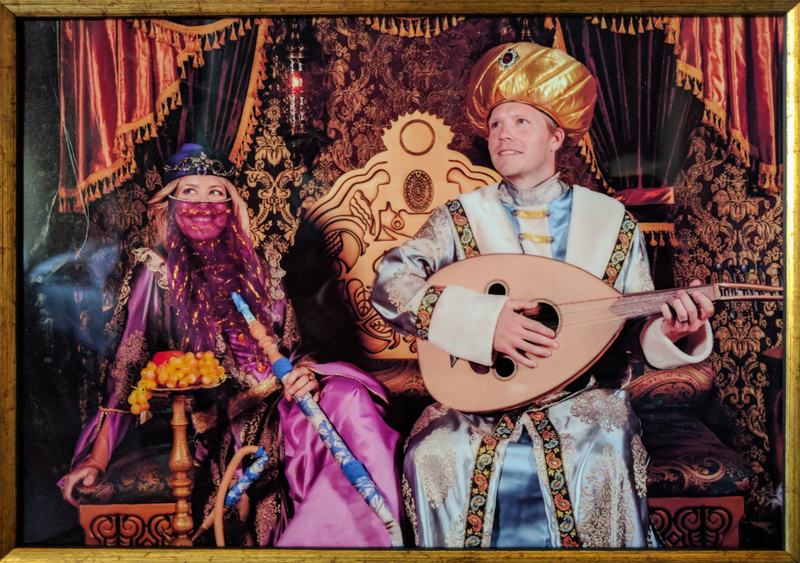 It will take at least 2 hours to explore the grounds and all of the ostentatiously decorated rooms (including a “turban room” and a “circumcision room”). Marvel at the amount of detail that went into every door, every tile, and all of the intricate gold serving ware. The Harem House costs a bit more to visit (and is not included in the Museum Pass) but it is definitely worth it to see the private quarters of the sultans! 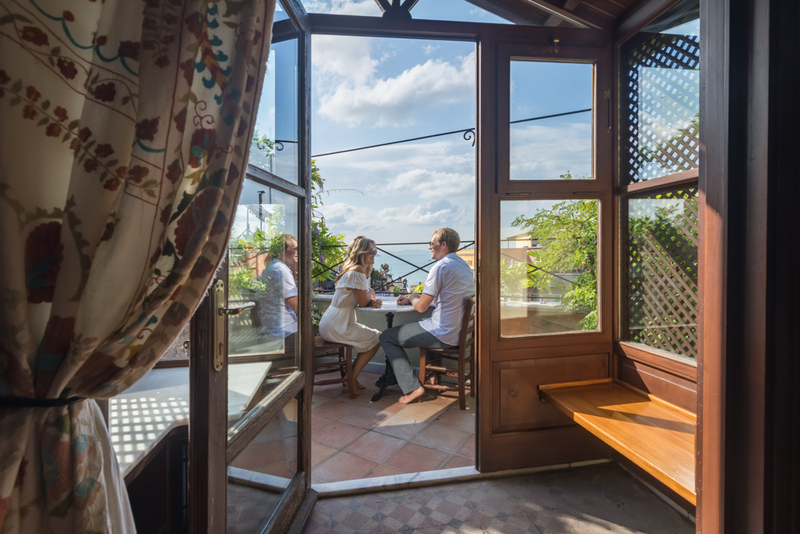 It’s been a long day, head to the rooftop of Seven Hills Restaurant in the center of the old city for wine and spectacular sunset views of the city. If you’re looking for a hipster chic neighborhood with funky art galleries and pubs… get on the Kadiköy ferry which departs every 20 minutes and it a quick 25-minute ride to the Asian side of the city. The Kadiköy neighborhood is the “hipster” neighborhood with streets lined with funky art galleries, themed bars, and quirky shops. It’s where the young, hip, and slightly emo kids of Istanbul hang out. After having a walk around the neighborhood, stop at Çiya Sofrasi for a wide variety of Turkish dips and traditional dishes for lunch. The streets are filled with fun themed bars so you can set down, enjoy an ice cold craft beer and immerse yourself in scene. 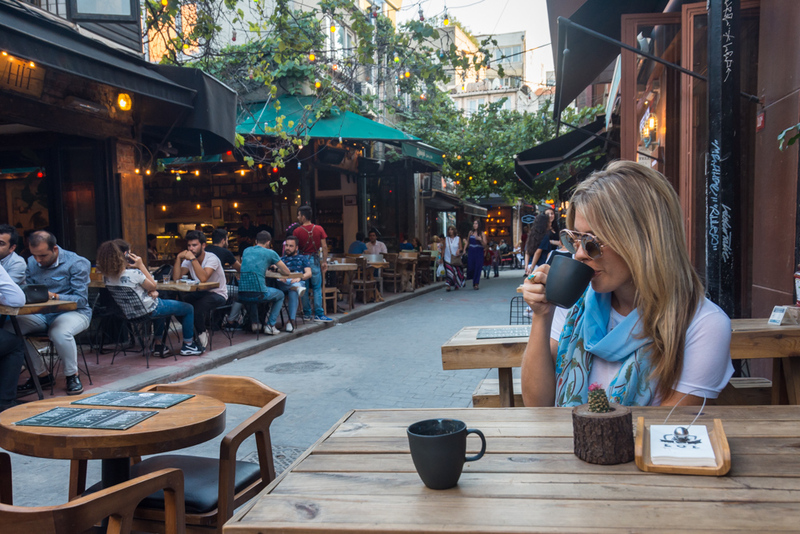 If you’re looking for the “hip industrial district” scene where the young and elite sip fancy coffee concoctions… head to the Karaköy neighborhood. Start with the Istanbul Modern Museum where an eclectic collection of paintings, video, and interactive art pieces are exquisitely displayed. The museum is much larger than it looks from the outside and will take a few hours to explore in its entirety. Museum browsing is always exhausting so after you’ve covered the main floor and the basement, you can head to the little museum cafe for a coffee if you’d like lovely sea views. Or better yet, walk over to Kılıç Ali Paşa Mescidi Sk. which is a hip, bustling street in the middle of a sea of industrial buildings and ongoing construction. LOL Coffee Roasters serves up freshly brewed exotic coffee blends and fancy flavored specialties. Grab a table on the street or up on the second floor patio and sip your pumpkin-flavored coffee while watching the trendy locals stroll by. As you sit, consider how differently people are dressed in these neighborhoods as compared to the area around the Blue Mosque and within the walls of the Grand Bazaar; half shirts will far outnumber head coverings. Kılıç Ali Paşa Mescidi Sk. street only gets more popular as the sun sets so if you’re up for it, stay for dinner, overpriced drinks, bumping music, and a lively atmosphere. Pim Karaköy has the best wine pours and cheapest beers around and it’s close enough to the action while still being able to carry on a conversation. If you’re looking for a more upscale experience and a “western world” vibe… check out Arnavutköy. It’s a cute little neighborhood that has darling, colorful houses that resemble the row houses of San Francisco. It’s also a popular area for expats to live so you’re likely to meet foreigners here. Have a cocktail overlooking the sea at Any Restaurant and then roam around the cute backstreets admiring the architecture. Have a sunset stroll along the boardwalk to the Bebek neighborhood further north. Finish with dinner and drinks at one of the many delectable seafood restaurants offering views of the Bosphorus. After dinner head back to Hotel Empress Zoe for a glass of wine on the terrace overlooking the city below. Soak in the sights and sounds of the city you’ve spent the past 3 days exploring and start planning your trip to return! Take a cooking class! Cooking Alaturka offers a fun and informative class and will leave you with recipes to try back at home! 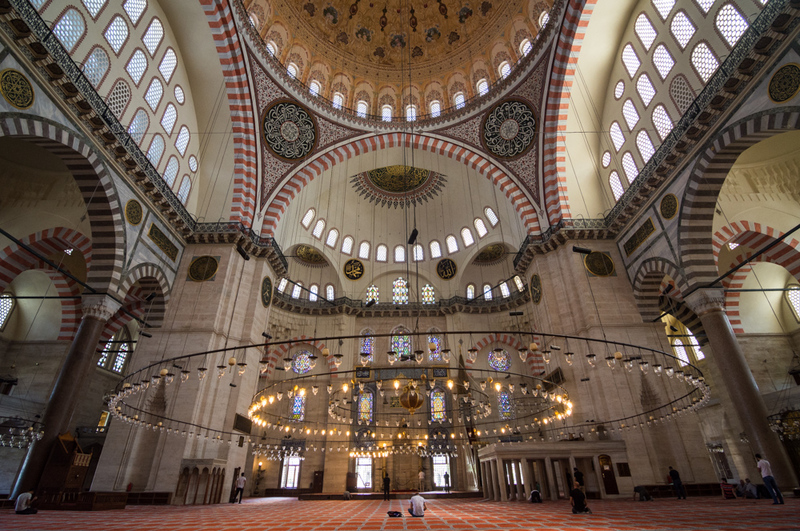 Check out the Süleymaniye Mosque which is arguably even more beautiful than the Blue Mosque on the inside but without the crowds. The views of the city from the courtyard are stunning! The Arasta Bazaar (just a couple blocks from Hotel Empress Zoe) offers many of the same souvenirs as the Grand Bazaar but with less hassle. There are numerous touts offering hour-long boat tours of the Bosphorus at a bargain price (15-30 TL). It’s a good choice for Sundays as the public ferries run fewer routes. 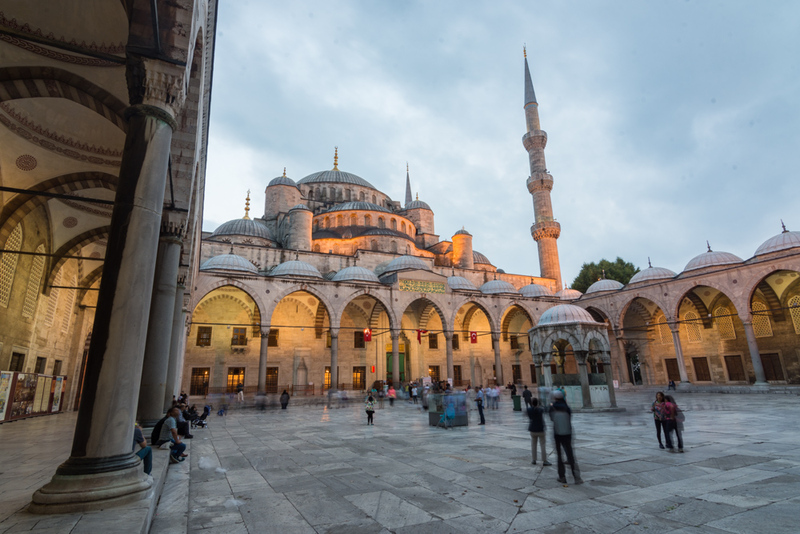 Looking for more Istanbul itineraries? Check out our favorite books! Good job Valery. You guys had so much fun 🙂 We spent a month in Istanbul a year ago to the day; loved it. I was caught wandering down that exact street in Karakoy where you are enjoying your beverage. 30 plus times at least because I walked through there 1-2 times daily 😉 Magical city and what nice people and GREAT food too. I’ve been to Turkey but never to Istanbul, I’m impressed with how much you fitted into 3 days. Love the fact that you started with shopping first! The list of boutiques and of restaurants is really handy too! Wow, I’m impressed how much you were able to pack in just 3 days. I’ve been to Istanbul once and found it overwhelming. Though I was there for business and did not have much time to tour around. Love your suggestions and especially the cooking class. I know Turkey is known for the food and I’d love to learn how to make a few things. Did you enjoy Turkish wine? I really liked it and found it quite pleasant. Great itinerary!! Istanbul is a fantastic city. I enjoyed the vibe and the blue mosque is stunning. I had the pleasure of hanging around with family as my cousin married a Turkish women. Seeing the city as a local with them was incredible. I can’t wait to go back!!! Oh awesome! Did you actually get to go to a Turkish wedding? I would’ve loved to attend one! What a great guide to Istanbul. You’ve given some great advice when going to the Grand Bazaar. Picking up business cards, stopping for lunch and then starting the haggling is a great way to shop there. Turkish food is some of my favourite food, the cooking class would be perfect to be able to replicate it at home. The Grand Bazaar was amazing shopping but SO overwhelming! Thanks so much for reading! Great itinerary! We did a layover private tour in Istanbul last year and really enjoyed it. Of course, we wish we had time to see more of the city but there’s always the return trip. I, definitely, want to check out the Bosphorus cruise. I was really bummed that we missed that. I’m pinning this so I’ll have it for our return! Thanks Mia! I hope you get to visit Turkey again soon! Istanbul is been on my list for years. Thanks for the detailed itinerary. One thing is for sure, when I go there I will make sure to pack and extra bag, the shopping sounds incredible! The shopping is the BEST! You’ll definitely need extra luggage to get all of your treasures home! Istanbul looks so amazing! I’d love to visit. Hotel Empress Zoe looks like a fantastic hotel and I love the garden area! 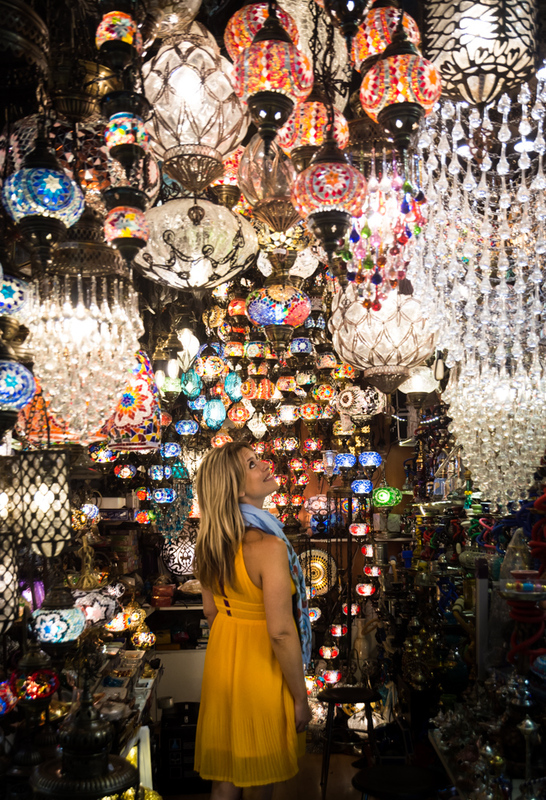 Shopping at the Grand Bazaar would be a must for me as well, and I like how you included a hamam visit in the afternoon for a break–great way to get ready to shop! Would love to check out the coffee in the Karaköy neighborhood, too! 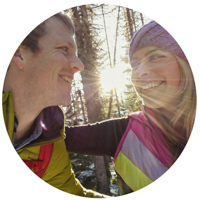 Thanks for a great list of spots to see!